Free surface oscillations in a narrow gap between elongated parallel bodies are studied numerically. As this represents both a highly resonant system and an arrangement of relevance to offshore operations, the nature of the damping is of primary interest, and has a critical role in determining the response. Previous experimental work has suggested that the damping could be attributed to laminar boundary layers; here our numerical wave tank successfully resolves both wave and boundary layer scales to provide strong numerical evidence in support of this conclusion. The simulations follow the experiments in using wave groups so that the computation is tractable, and both linear and second harmonic excitation of the gap are demonstrated. Buchner, B., Van Dijk, A. & De Wilde, J. 2001 Numerical multiple-body simulations of side-by-side mooring to an FPSO. In The 11th Intl Offshore Polar Engng Conf., ISOPE. Chen, X. B. 2005 Hydrodynamic analysis for offshore LNG terminals. In Proceedings of the 2nd International Workshop on Applied Offshore Hydrodynamics, Rio de Janeiro. Chua, K. H., de Mello, P., Malta, E., Vieira, D., Watai, R., Ruggeri, F., Eatock Taylor, R., Nishimoto, K. & Choo, Y. S. 2018 Irregular seas model experiments on side-by-side barges. In The 28th Intl Offshore Polar Engng Conf., ISOPE. Faltinsen, O. M. & Timokha, A. N. 2009 Sloshing. Cambridge University Press. Faltinsen, O. M. & Timokha, A. N. 2015 On damping of two-dimensional piston-mode sloshing in a rectangular moonpool under forced heave motions. J. Fluid Mech. 772, R1. Feng, X. 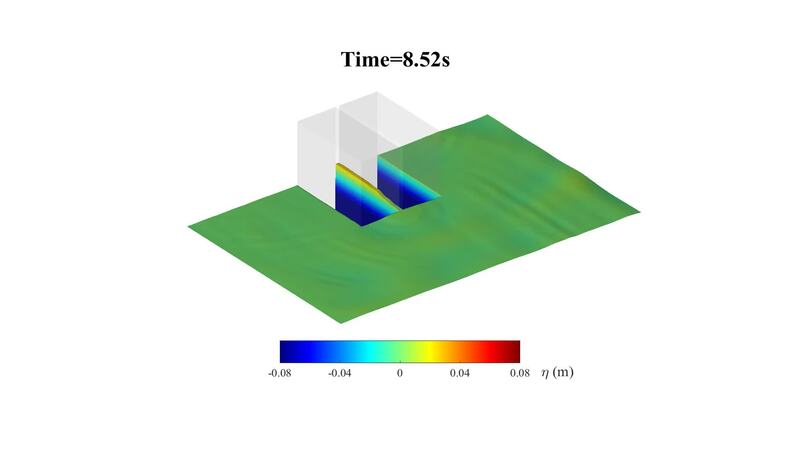 & Bai, W. 2015 Wave resonances in a narrow gap between two barges using fully nonlinear numerical simulation. Appl. Ocean Res. 50, 119–129. Feng, X., Bai, W., Chen, X. B., Qian, L. & Ma, Z. H. 2017 Numerical investigation of viscous effects on the gap resonance between side-by-side barges. Ocean Engng 145, 44–58. Fitzgerald, C. J., Taylor, P. H., Eatock Taylor, R., Grice, J. & Zang, J. 2014 Phase manipulation and the harmonic components of ringing forces on a surface-piercing column. Proc. R. Soc. Lond. A 470 (2168), 20130847. Fredriksen, A. G., Kristiansen, T. & Faltinsen, O. M. 2015 Wave-induced response of a floating two-dimensional body with a moonpool. Phil. Trans. R. Soc. Lond. A 373 (2033), 20140109. Jacobsen, N. G., Fuhrman, D. R. & Fredsøe, J. 2012 A wave generation toolbox for the open-source CFD library: OpenFoam® . Intl J. Numer. Meth. Fluids 70 (9), 1073–1088. Jensen, B. L., Sumer, B. M. & Fredsøe, J. 1989 Turbulent oscillatory boundary layers at high Reynolds numbers. J. Fluid Mech. 206, 265–297. Kristiansen, T. & Faltinsen, O. M. 2012 Gap resonance analyzed by a new domain-decomposition method combining potential and viscous flow draft. Appl. Ocean Res. 34, 198–208. Kumaresan, R. & Tufts, D. W. 1982 Estimating the parameters of exponentially damped sinusoids and pole-zero modeling in noise. IEEE Trans. Acoust. Speech Signal Process. 30 (6), 833–840. Meylan, M. H. & Eatock Taylor, R. 2009 Time-dependent water-wave scattering by arrays of cylinders and the approximation of near trapping. J. Fluid Mech. 631, 103–125. Molin, B. 2001 On the piston and sloshing modes in moonpools. J. Fluid Mech. 430, 27–50. Molin, B., Remy, F., Camhi, A. & Ledoux, A. 2009 Experimental and numerical study of the gap resonances in-between two rectangular barges. In 13th Congress of the International Maritime Association of the Mediterranean, Istanbul, Turkey. IMAM. Molin, B., Remy, F., Kimmoun, O. & Stassen, Y. 2002 Experimental study of the wave propagation and decay in a channel through a rigid ice-sheet. Appl. Ocean Res. 24 (5), 247–260. Molin, B., Zhang, X., Huang, H. & Remy, F. 2018 On natural modes in moonpools and gaps in finite depth. J. Fluid Mech. 840, 530–554. Paulsen, B. T., Bredmose, H., Bingham, H. B. & Jacobsen, N. G. 2014 Forcing of a bottom-mounted circular cylinder by steep regular water waves at finite depth. J. Fluid Mech. 755, 1–34. Perić, M. & Swan, C. 2015 An experimental study of the wave excitation in the gap between two closely spaced bodies, with implications for LNG offloading. Appl. Ocean Res. 51, 320–330. Sumer, B. M. & Fredsøe, J. 2006 Hydrodynamics Around Cylindrical Strucures. World Scientific. Sun, L., Eatock Taylor, R. & Taylor, P. H. 2010 First-and second-order analysis of resonant waves between adjacent barges. J. Fluids Struct. 26 (6), 954–978. Tan, L., Lu, L., Tang, G. Q., Cheng, L. & Chen, X. B. 2017 An energy dissipation model for wave resonance problems in narrow gaps formed by floating structures. In 32nd Intl Workshop on Water Waves and Floating Bodies, Dalian, China. Wang, H., Draper, S., Zhao, W., Wolgamot, H. A. & Cheng, L. 2018 Development of a computational fluid dynamics model to simulate three-dimensional gap resonance driven by surface waves. J. Offshore Mech. Arctic Engng 140 (6), 061803. Whitham, G. B. 1963 The Navier–Stokes equations of motion. In Laminar Boundary Layers (ed. Rosenhead, L.). Clarendon Press. Zhao, W., Wolgamot, H. A., Taylor, P. H. & Eatock Taylor, R. 2017 Gap resonance and higher harmonics driven by focused transient wave groups. J. Fluid Mech. 812, 905–939. Movie 1 (for mesh A3) shows the numerically computed free surface elevation around the boxes during passage of the incident transient wave group for Case A (in the region 2.5 m < x < 8.5 m, -4.0 m < y < 0 m, which is not the full extent of the NWT). Note that the vertical axis is stretched, such that 1 unit in the vertical = 5 units in the horizontal, to more clearly show the free surface motions. To this end, the boxes are shown as transparent.